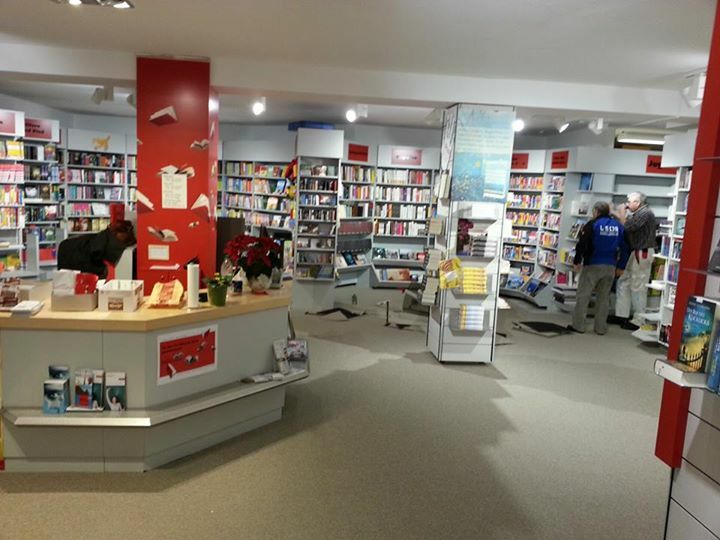 I recently returned to Europe for the first time since the release of my novel, The Munich Girl. Though my husband and I travel there a lot, this trip’s itinerary included places we’ve seldom or never visited. Our route followed the natural border of the Rhine River, which means we repeatedly encountered those curious amalgamations of cuisine, culture, architectural styles, and attitudes that occur along divisions that humans decide ought to exist simply because geography seems to suggest them. In the building dwarfed by its neighbors in the photo to the right, we, in a scene like something out of The Pink Panther, spoke three languages with the server in the course of his taking our order. As we all tried to accommodate each other, one or more of us kept shifting to a new one at exactly the wrong time. But I think we all appreciated the spirit of our intent. We still wound up with some of the best Alsatian cooking I’ve had in a long time, generous with onions, cheese, and light buttery pastry I’ve found nowhere else. This section of France’s border with Germany is long-accustomed to shifting back and forth between nationalities and languages. As our tour guide explained why it is that even the youngest schoolchildren here have their classes in at least three languages, she described how, between world wars and other upheavals, her grandfather’s nationality changed four times in his 20th-century lifetime, though he never moved from his home city. Much like clouds and changes in the weather, political insistence and other demands that humans impose on each other can come and go, often with great extremes. Within individual lives, challenges can arise in this way, too. How we face and meet our choices — and what that helps us become — seems the vital focus in it all, however dire or uncertain things may appear. And in that experience, though we walk the path of our individual lives alone, we also seem inextricably linked. This is one of the themes that I hope the story of The Munich Girl manages to convey. Traveling along the borderlands of this river reminded me that navigating shifts in our circumstances is one of the main opportunities we receive to hone and develop some particularly pleasing qualities. I encountered them over and over in our stops along this route: a spirit of acceptance, flexibility, adaptability. Resilience. Relaxed openness. Even, delightfully, a kind of good-humored playfulness. It was as if over time, through all of that practice with change, people have adopted something of the flow that the river embodies. These might sometimes seem nearly contradictory. Perhaps the people I observed as I traveled have begun to reconcile what joy and hardship have to show us when we don’t impose a border between them; learned to understand that, like the waters of the river, each comes and goes, like the clouds and waters — and even invading armies. But we get to decide how we embrace and anchor our own happiness. Categories: On the heart's path, Sustainable Future, The divine in the details, The Munich girl - A novel, This writer's path, World citizenship | Tags: acceptance, adaptabilty, Bahá'í Faith, borders, created for happiness, created to bear and endure, Europe, humor, joy, language, resilence, The Munich Girl: A Novel of the Legacies That Outlast War | Permalink. I am living and reading in two languages. Sort of. I’m in Germany for, among other things, work on a book, which I do in English. (Or at least, I like to think so.) Meanwhile, the rhythm of the rest of my life right now is mostly a German soundtrack. I know that the more time I spend writing in English, the more I flounder in German. Sometimes, when I’ve been really immersed (one might almost say relaxed into) German, I struggle for the words in English. At times, I feel like a refugee from the lands of both languages. The remedy for this arrived on a recent rainy weekend when Buchhandlung Moritz & Lux was kind enough to have its Wertheim branch open. When I get to feeling a bit lost in the world, or a day, I can always find balance again in a bookstore. This one eliminated my taking the easy road – there was no English section. I was nearly contenting myself with a book of Anthony de Mello’s, as he’s a longtime friend of my soul. But geesh, I knew it would be tough going. Then, there she was on a shelf next to his – old friend Louise Hay, God bless her. I could feel instantly how perfect this was. This is the kind of reading that, I knew from experience, I would do with my heart — which, I’m realizing, is the only way I ever really do anything. So if I want to deepen into German, this is the soul-sized way, for me. Meditationen für Körper und Seele, it’s called – Meditations for Body and Soul. 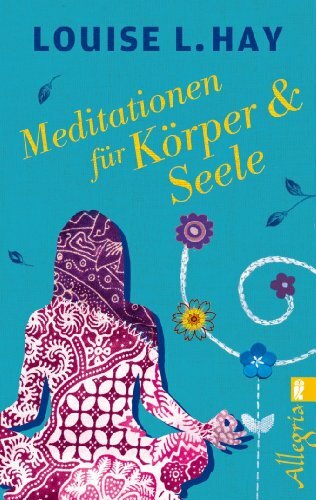 The blurb advises: “Mit diesen Meditationen erhalten wir den wichtigsten Schlüssel, um negative alte Gedankenmuster aufzulösen und wieder Vertrauen in die positiven Kräfte des Lebens zu gewinnen.” With these meditations we receive the most important key to resolve negative old thinking and restore confidence in the positive forces of life to win. Or, one might say, we “restore confidence” (love that phrase) in the power of the building of the good. Isn’t life ever-delightful in the way it nudges toward the very next just-right thing? Categories: Creativity and spirit, On the heart's path, The divine in the details, This writer's path, World citizenship | Tags: Anthony de Mello, Germany, language, Louise Hay, Moritz & Lux, soul, Wertheim, writing | Permalink.